Giorgio Armani's new Eyes to Kill Eyeshadow Palettes ($59) are said to offer the perfect matte with the perfect satin - the perfect match between colors and textures. I wasn't at all sure about that "perfect matte," but when I saw the palettes, I bought five - without hesitating. I plan to buy two more tonight. Today, I show you Parma, #8. Parma (#08) offers a gradation from dewy lilac to an iconic amethyst powder. Two variations of lilac rose tinted with blue reflections remind of spring colors - from the sky at dawn to blooming flowers. The gradation goes into a sparkling mineral dust before ending in an intense amethyst violet, echo to the homemade eye shadows crafted by women in ancient Mediterranean civilizations. I can't keep repeating all the superlatives that describe the new Eyes to Kill Eyeshadow Palettes. I feel like a broken record. I have featured them here, here, and here. Please forgive me for posting these one at a time. It has been cloudy every day. Whenever I can grab a little sunshine, I swatch another one. Parma surprised me a bit. 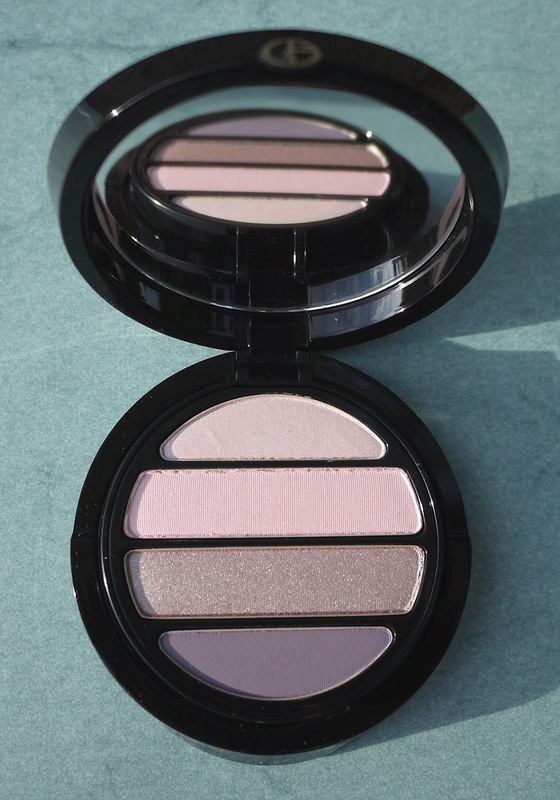 Although I don't usually buy pink/lavender palettes, I was attracted to this one by the top three shades. I wasn't sure about the bottom shade, but I didn't take the time to play with it in the store. I knew I'd love three of the four shades - and I do. That was enough for me. I swatched the shades heavily with a sponge-tipped applicator, and I took my swatch photos in very late-afternoon sun. I'm wasn't thrilled with my photos, which were dark, but I found one that would "do." The two pinks at the top of the palette are unique. Armani calls them lilac rose with blue reflections. You be the judge. The icy pink at the top of my arm offers a subtle shimmer and is a gorgeous highlighting or layering shade. Even I can wear it, unusual for a pink shade. The warmer pink below it is drop-dead gorgeous. It also has a shy shimmer finish. The mauve-leaning taupe - called sparkling mineral dust - is absolutely stunning (remember Ab Fab?). Again, it shimmers - not sure how or why these shadows were characterized as offering satin and matte finishes. Consider the top three colors, and Parma is worth every dime of the $59. Then we get to the "intense amethyst violet." It resembled a blue-toned lilac in the palette. I can wear blue-toned violets. Applied to my skin, though, it took on the appearance of a bruise. It has far too much red in it for me to wear - a total surprise. I can see this shade on someone whose skin is medium to dark. On very dark skins, it will be stunning. On mine? Unflattering would be an understatement. Hey, three out of four isn't bad. The collection still isn't available at Giorgio Armani Beauty's Web site, but you can buy it at Saks Fifth Avenue and Neiman Marcus for sure. I purchased mine at the Saks in Chevy Chase. Thank for you posting. The colors are beautiful! How would you wear the eye shadows? I have heavy lids and wonder if I can wear more than one color at once. Can't wait to see your other reviews! Thank you for your swatches, I'm thinking of the Pantelleria palette. I have hazel eyes. Never tried Armani eyeshadows before, all of the palettes are very pretty. Lizzy, definitely use the lighter colors on heavy lids. Just experiment. Or ask a makeup artist for advice. I like shimmery shades for the lid below the crease for heavy lids. Then I would skip a crease shade. Depends totally on what you mean by heavy lids. I assume you mean an "overlay." Stay away from that area, and play up the lid right above your lashes. Mary Ann, Pantelleria is absolutely gorgeous and a must-have. This palette has my name all over it :-) I love colors such as these and the touch of blue, whether it is a reflection, pearl, or shimmer, adds depth and complexity to the shades. Chanel's Vanités has that hint of blue in the pale lilac, orchid, and deep lavender shades and then the bronze has a hint of rose. It's a stunning palette, but it is composed of four shimmery shades which makes it better suited to evening wear since I wear all four shades at once. It will be nice to have something similar (minus the bronze) in a more modern selection of finishes. I can hardly wait to see all the new Armani palettes. The ones you have shown us so far are all beautifully though out and executed. Oh this is so pretty! I'm just wondering if it will work with my eyes which are a greenish brown. Now that Eileen has reminded me, I have Vanites too and it does work for me so maybe this will too. I need and want this one!!!! I can't bring myself to close the page on my computer. I look over and over, the colors are so beautifuuuull! I am in love I think, and funny enough, this type of color is not a habit of mine...Weird but I Am in love. "L'amour a ses raisons que le coeur ne connait pas"
That's why I adore them. You can always build color, but taking it way can be tricky. Will you be shopping this weekend? They aren't terribly shimmery. I would wear them during the day. Evelyn, it will work with your eyes. I think they key is skin color. Hi, Virginie, it is a "looker." Parma! Live there? You must have this! Oh yes! I live in Parma, I'm Italian!! ihihih :-D you're right! I must have! Hi, what a beautiful palette! I am guessing that if you wet a fine eye brush and used that darkest color as a liquid to line your eyes, it would look fabulous with the other colors placed on and around your eyes. I agree, it looks a little strange on your skin in the swatch shot, but as a liner it could be great. BTW loving your blog, thank you for it! Thank you, Karen! Welcome aboard. All the shades in the bottom of these palettes were designed by Armani to be liners. However, you can use them lightly to create dramatic looks. I have a question related to the eyeshadow amount in each of the new Armani quads - just so I can compare relative to Chanel/Guerlain. How many ounces are in each? I have no idea how one would figure that out. Each palette lists the total weight in ounces, not the product weight of each shadow. Perhaps you could check with the product specialists for these lines at one of the stores. I'm not sure they can help you, but they might try. I'd recommend you give it a shot at Bergdorf Goodman or another store that carries all three lines.